Typically, dry eye disease can be diagnosed through a comprehensive eye exam and a description of your symptoms. 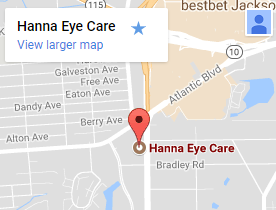 On some occasions our eye doctor in Jacksonville, FL might decide to do a test that measures how quickly your tears evaporate from the surface of your eye. By instilling a simple dye called fluorescein (much like food coloring) the doctor is able to watch and count how long it takes the tears to start to break up after they’ve asked you to hold your eyes open after a blink. This is called TBUT or a Tear Break Up Time test. A low TBUT generally indicates a lipid (aka oil) deficiency in the tears resulting from oil glands in the eyelids not functioning properly. In another type of test, called a Schirmer test, a strip of filter paper is placed under the lid of the eye and you will be asked to close your eye for five minutes. Following the test the amount of moisture on the strip will be measured. Schirmer tests are performed less frequently than a TBUT test. There are many treatment options for dry eyes which are highly dependant upon the cause and severity of the condition. Many mild forms of DED can be alleviated using artificial tears or lubricant eye drops to make up for the lack of natural tears usually produced by your eyes. If over-the-counter drops don’t alleviate your symptoms, your Jacksonville optometrist might prescribe prescription drops that actually stimulate tear production or steroids for short-term relief. In cases where discontinuation or switching to different medications is possible this can eradicate symptoms. Your Jacksonville eye care expert may also recommend that you limit or refrain from contact lens use for a certain amount of time or switch to a different brand or type of contact lens which will reduce dehydration. We also treat less chronic issues, and eye care emergencies!